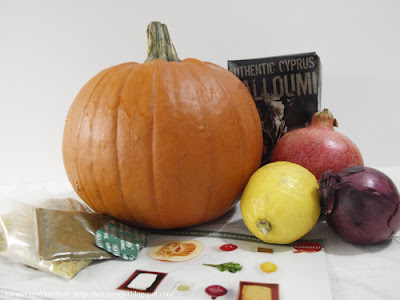 Farmersgirl Kitchen: Gousto - Win Dinner in a box! Although I love to plan ahead and decide what I'm going to cook, sometimes it's difficult to find the time to get organised and because I love my food so much, I'd prefer not to have a freezer meal very often That's why I was so pleased when Gousto Simply Cook contacted me to try out a couple of their Gourmet recipe boxes. 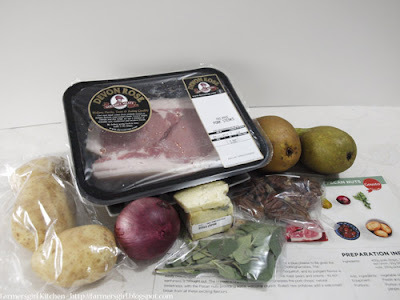 What is a Gousto Gourmet Box? Gousto provides you with all the ingredients in the right proportions to cook delicious meals at home. The produce is organic, fresh and seasonal. Gousto’s recipes are developed by a team of passionate chefs and tested by their friends and families first (very picky people). You get to choose the recipes online and every week the selection is updated to make sure there’re plenty of new recipes for you. The recipes are delivered right to your doorstep once a week so you decide when to cook. Whenever you’re on holiday or just don’t have time, simply place the subscription on hold – it’s easy. In practice it is very simple, in a trial subscription you can decide whether to try 3 meals a week or 4 meals a week. Three meals a week for two people for the Gourmet box costs £42 (around £5 per person per meal) and for the Veggie Box it costs £39. Once you have your trial subscription you can log in to the Gousto Simply Cook website look at the list of recipes and choose what you would like to make, and there is a wide range to choose from and they are added to each week. You then add the recipes to you basket and sit back and wait! What I really liked about the website was the delivery address checker, I live in rural south west Scotland and have had problems with deliveries e.g. Ocado don't deliver to our area. So I was delighted to be able to put in my postcode and find that my parcel would be delivered on a Wednesday. Gousto are currently delivering to all postcodes in the UK apart from a few very remote areas, they deliver in London on a Tuesday between 1pm and 6pm and to other UK areas on a Wednesday, 9am - 5pm. The ingredients duly arrived on the appointed day packed expertly in a box with a fleecy lining and icepacks, there were no issues about signing for it and Gousto are happy to take instructions as to where to leave the parcel if you are out. I have always wanted to try halloumi cheese, but for some reason I never got round to buying it. What a fantastic recipe, the pumpkin chunks are roasted in the oven with the onions, the halloumi cheese is fryed and served on top of a bulgar wheat salad which includes the roasted vegetables, pomegranate and mint. It was really delicious and probably not something I would have made otherwise. The oven baked pork chops with pears, stilton and pecan nuts use a similar technique to the pumpkin recipe as the pears and onions are oven roasted with the spices. I love blue cheese and the combination of the sweet fruit, slightly earthy taste of the pecan nuts and the sharp, saltiness of the cheese was a treat to eat. The recipes are excellent and are definitely something that I would want to make and eat. There are interesting and exciting vegetarian options. The delivery service is one of the best I have experienced. There is also very little waste as you only get enough of the ingredients to make the meal. I would consider using the service if I was going on a self catering holiday and wanted to make nice food without the hassle of shopping, but I don't think it is something I would use on a weekly basis. If, on the other hand, you find it difficult to decide what to make but love good food and are happy to cook, this is a great way to try out some new recipes and ingredients. You can win a Gousto Gourmet Box that feeds two people by following the instructions on the Rafflecopter widget. This Giveaway is only available for entrants with a UK delivery address. I was supplied with a Gousto Gourmet Box with two meals for two people. I was not obliged to write a positive review and all opinions are my own. Mascarpone Farfelle with Chicken, Sundried Tomatoes & Spinich...Sounds lovely! Never had halloumi cheese Janice? I am surprised, it never lasts very long in this house. Those recipes should delicious. Tahini crusted cod sounds lovely. I think the shakshouka would be good. Miso mirin noodles with aubergine, although I like the look of your pork chops or your halloumi one. Roasted Vegetable Penne with mozarella! yum! Roasted Vegetable Penne with Mozarella sounds absolutley delicious!! Creamy beetroot & leek risotto. Perfect for a vegetarian that gets bored easily of the usual fare. Well I'd really like the halloumi meal you made Janice, but that doesn't seem to be on the site now. 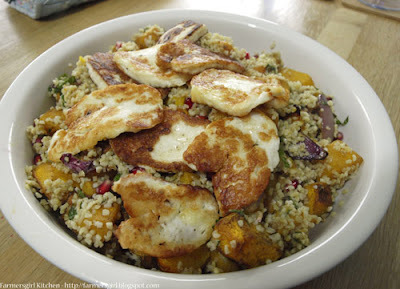 So I'd pump for the ras el hanout halloumi instead. Creamy Beetroot and Leek Risotto would be lovely! Easy choice, no need to read nay further than the first one: Creamy beetroot and leek risotto. I love beetroot and I love risotto! Come to think of it, why have I never thought of combining the two? I'd go for the Miso Mirin Noodles and Aubergine, though Mr B might have other ideas! Sweet chilli and lime beef on noodle salad looks delicious! South Indian Prawn Masala mmm! the beetroot with leek risotto would be fab. Mascarpone with farfelle, chicken, sun dried tomatoes and spinach sounds divine. Looks like a nice hamper. I would try the Wild Boar Ragu with Linguine. Pork Fillet with Italian Style Butterbeans and Potatoes. I like the look of the Lamb and Rosemary Linguine with Artichoke. 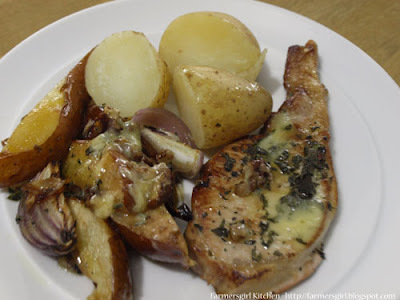 I'll choose the Pork Chop with pears, Stilton and Pecan as I always struggle with how to flavour my meat and I love the sound of the different textures and flavours here. The creaminess of the cheese contrasted with the crunch from the pecan and the sweetness of the pear to balance out the meatiness of the pork. Sounds delicious. Sweet Chilli and lime beef on noddle salad. The Pork Fillet with Italian style Butter Beans sounds so yummy. wild boar with liguinie had boar when in italy last year and everyone loved it even my picky teenager, a first! The quinoa burgers and fresh salad sounds lovely (and I've been looking for some quinoa ideas!). The pork noodles & plum sauce sounds gorgeous!! I would choose Sweet Chilli and Lime Beef on noodle salad, sounds lovely!